If you wanted a wireless home security camera a couple of years ago with advanced technology like AI-powered face recognition, you would’ve had no choice but to spend $300 on a Nest Cam IQ. If you want one today, however, you only have to spend $44.99. Amazon has a 10% coupon for the YI Home Camera 3 Wireless Security Cam, which is the lowest price we’ve ever seen. That means you can buy six of these great cameras instead of a single Nest Cam IQ, and you’ll still have $30 left over! ONE YEAR WARRANTY: Because we trust our products we deliver them with 365 days warranty. Our professional customer service has your back. 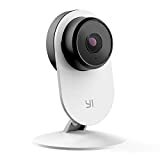 In the box: AI featured security camera YI Home Camera 3 with 1080p -FHD Resolution, 107 degree wide-angle, baby-crying detection, magnetic base 7.8 inch USB A to Micro USB cable, 100-240V 1A adaptor, user manual, YI Cloud introduction and 6 month cloud storage.